The Nutcracker, a two-act ballet with a score by Tchaikovsky, premiered in St. Petersburg in December of 1892. The complete Nutcracker has enjoyed enormous popularity since the late 1960s and is now performed by countless ballet companies, primarily during the Christmas season. 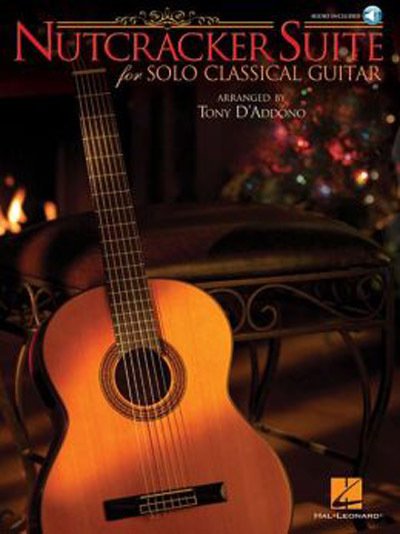 Here are stunning solo guitar arrangements of 8 pieces, with a CD of complete performances: Arabian Dance (“Coffee”) • Chinese Dance (“Tea”) • Dance of the Reed-Flutes • Dance of the Sugar Plum Fairy • March • Overture • Russian Dance (“Trepak”) • Waltz of the Flowers.